Check out the latest Snack Sack Coupon on My Subscription Addiction! SnackSack Coupon – 30% Off Subscriptions! SnackSack Black Friday Coupon – 30% Off Subscriptions! SnackSack Labor Day Coupon – 30% Off Subscriptions! SnackSack Coupon – 20% Off Subscriptions! Today Only! SnackSack Coupon – 25% Off Subscriptions! SnackSack Cyber Monday Coupon – 25% Off Subscriptions! SnackSack Black Friday Coupon – 25% Off Subscriptions! SnackSack Back to School Sale – Up to 50% OFF! 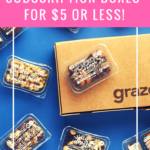 SnackSack 4th Of July Deal – up to 50% off Subscriptions!